There are many reasons why you may want to boil an egg but the most common reason is for health concerns so let’s discuss why and how to boil an egg. The main reason why people want to boil an egg is not for the taste or ease of eating a hard boiled egg but because of the benefit of being able to easily separate the egg yolk from the egg white.? The egg yolk contains a very high concentration of cholesterol that is not good for you in any way, shape, or form.? The egg white on the other hand is a healthy food item and contains high protein and vitamins for your nutritional diet.? Trying to crack an egg and separate the yolk from the white can work some of the times, but other times the yolk breaks and gets mixed into the egg white.? By hard boiling an egg you can avoid this and very quickly and easily get the egg white and dispose of the egg yolk. 1.? 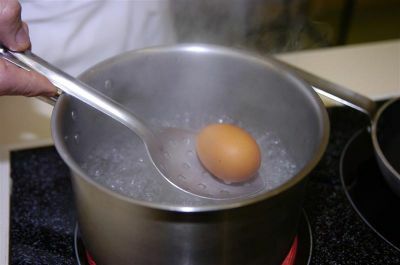 Get a pot (or even a pan if you do not have a pot), place your egg(s) into the pot, and add water and bring it to a boil.? The water level has to be high enough so cover the entire egg so usually that is about three inches or more of water.? If you do not cover the entire egg in water the egg can come out uneven. 2.? Once the water is boiling reduce the heat to a medium/medium low.? If you are making a hard boiled egg you will leave the egg like this for 12 to 14 minutes on the stove.? If you are making a soft boiled egg you will leave it on the stove for 90 to 180 seconds.? The difference between a hard and a soft boiled egg is whether you want the yolk to be solid and whether you want the egg white more solid or more soft.? A hard boiled egg is solid yolk and solid egg white. 3.? After the egg is done boiling you want to take it out of the pot with a spoon and set it aside to let it cool down.? A hard boiled egg should cool down completely so you can place it in the fridge if you want to cool it down faster.? A soft boiled egg you can pour cold water over for a short while to cool it down and then you can eat it while it is still warm. That is how to boil an egg which we highly recommend for health reasons to avoid eating that egg yolk.? While it tastes good, it is not good for your health or your heart.